High Life Highland (HLH) and The University of the Highlands and Islands have signed an agreement to work together to benefit individuals, communities and businesses across the Highland area. Both organisations already have a track record of collaboration with a number of programmes across various HLH services and study programmes, but have now formalised the arrangement through a memorandum of understanding that will see the relationship expanded to include initiatives in the fields of health and wellbeing as well as archives and museums. The HLH Sports team have also been in discussion with students studying towards their HND in Sports Coaching at Inverness College UHI and HLH Libraries staff are working collaboratively to promote and improve access to local special book collections and to develop research and teaching potential with the university. As part of the developing relationship, Inverness College UHI agreed to host the 2017 Youth Parliament Conference. Speaking after the conference, Youth Convener Calum Maclennan said, "We had an absolutely amazing conference at the Inverness College UHI building and the feedback we received from those taking part was really positive. 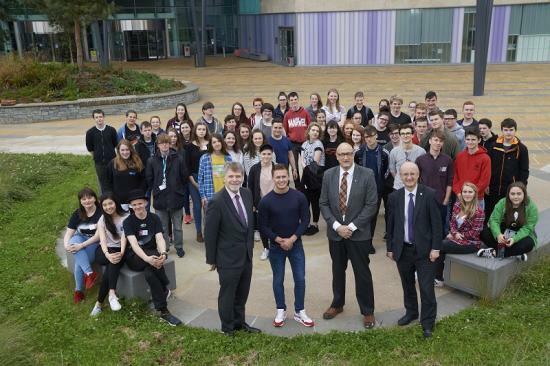 "Both the university and HLH are increasingly proactive in terms of the way they work with young people, so it seemed fitting that the Youth Parliament Conference, with around 100 young people from around the Highlands, was the event used to formally announce the partnership between the organisations." Neil Simco, Acting Vice-Principal (Research) at the University of the Highlands and Islands said: "It makes great sense for our two cross-regional organisations to work together for the good of our communities. There are many existing projects we have already gathered under this agreement in fields such as health, history, heritage and culture. We're looking forward to developing new opportunities with HLH for our students and staff and the wider community. Ian Murray, Chief Executive at High Life Highland commented, "We are very pleased to formalise our already productive relationship with UHI. I think HLH has a lot to offer various University of the Highlands and Islands partnership strands of study in UHI colleges throughout the Highlands and having an academic partner to assist in research benefits our work immensely. The newly signed minute of agreement means that we have a formalised arrangement in place that I hope will help both HLH and the university build upon the memorandum of understanding adds further weight to our joint commitment to expand areas of study and to pursue practical projects which can benefit the area."